Gerald graduated from Purdue University in 2009 with a B.S. in Business Management and Minors in Marketing and Finance. After working in corporate finance for two years, Gerald left the private sector and commissioned as a Marine Officer in 2011. During his time with 1st Intelligence Battalion aboard Camp Pendleton, California, Gerald served in Platoon Commander and Company Executive Officer billets. Gerald has one combat deployment to Helmand Province, Afghanistan. 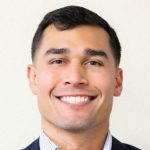 He transitioned from Active Duty to the Marine Corps Reserves in 2017 and will pursue his MBA at the UCLA Anderson School of Management as a member of the Class of 2019.